And the internet’s success has come at the cost of other traditional medias. In the same period (2005-2017) people who said TV was their main source of media has halved from 48 per cent to 24 per cent. 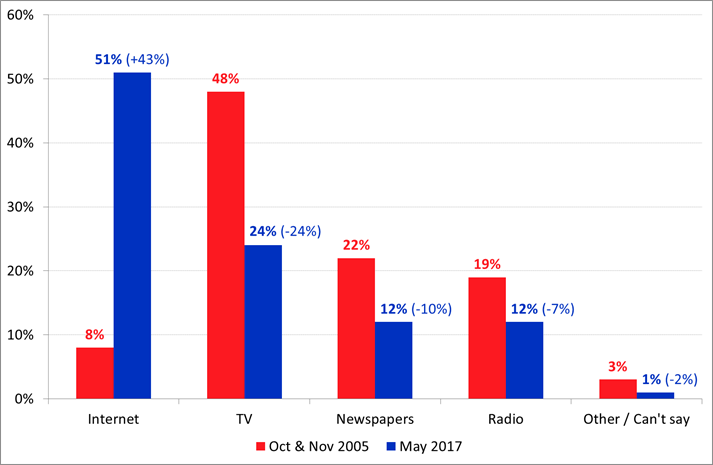 Likewise, people who said newspapers were their main source of media has fallen from 22 per cent to 12 per cent in 2017. Meanwhile, radio, although off a lower base, fell from 19 per cent to 12 per cent in the same period. Which Media is Your Main Source of Information? When it came to age demographics, respondents who said the internet was now their main source of media was 50-50 male to females. However, it was naturally much higher in the 14-24 demographic (81 per cent) than those aged 65-plus (15 per cent). More women (26 per cent) preferred to get their media from TV than men (21 per cent) and the 50-64 age bracket was the one that most preferred that medium. Only 10 per cent of 14-24 year olds picked TV as their number one. Men (14 per cent) preferred newspapers to women (10 per cent) and, unsurprisingly, newspapers were strongest in the over 65 demographic. Only four per cent of 14-24 year olds and eight per cent of 25-34 year olds picked newspapers as their preferred media option.